For one of the easiest, crowd pleasin’ weeknight meals, check out this low carb taco salad recipe. 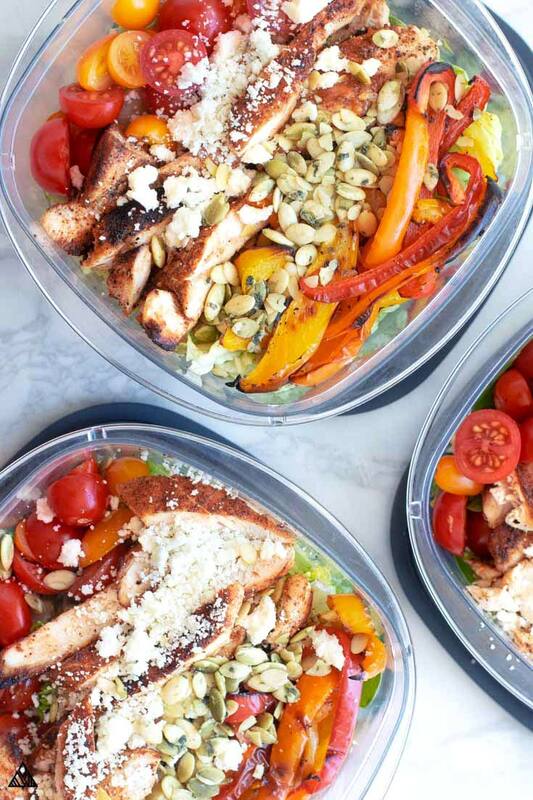 It’s filled to the brim with delicious low carb foods, such as avocados, cheese chips, low carb vegetables, and some delectably sautéed chicken! I make this low carb taco salad for every tailgate, potluck or girls night, and I come home with an empty bowl every time. 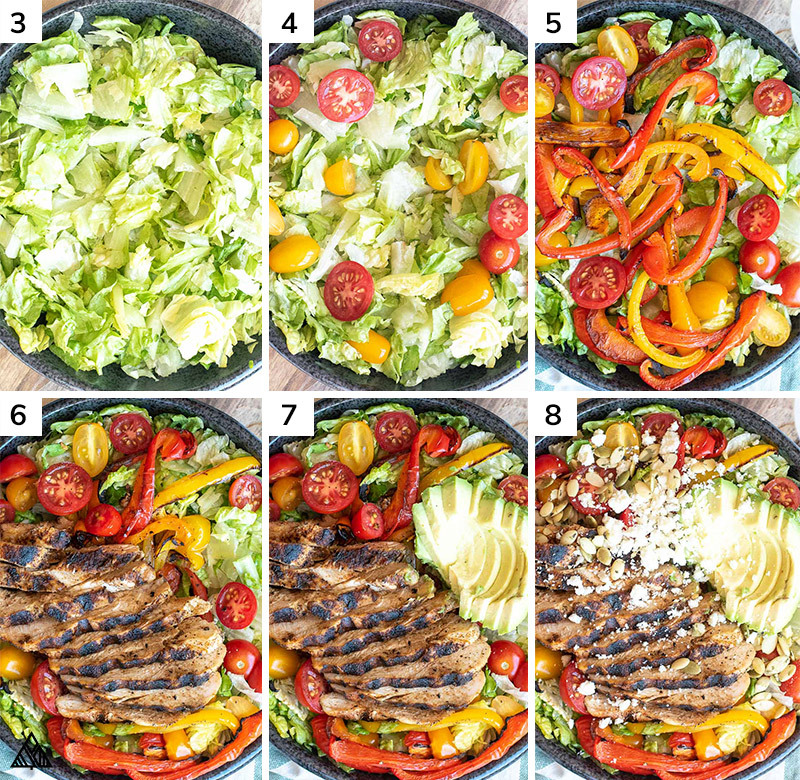 Needless to say you’re going to like this one, so let’s do this low carb taco salad thang! As with most low carb salads, the ingredients in this recipe are pretty flexible. Just toss in whatever low carb taco salad ingredient you love and skip whatever you can live without! I tried to make this low carb taco salad recipe as similar to the traditional recipe as possible by swapping ingredients for tastiest low carb shopping list items — as you can imagine, there are still a ton of carbs in taco salad without shell, so there was a lot to adjust! Instead of boring fried tortilla chips, we’ll make our very own cheese taco shells strips by baking pepper jack cheese into crispy and delicious strips, and covering our low carb taco salad with their delicious crunch. Most taco seasonings are full of sugar, cornstarch and flour, and who wants to waste their carbs on that?! Instead, we’ll sprinkle our chicken with delicious low carb taco seasoning — full of flavorful spices instead of filler ingredients. 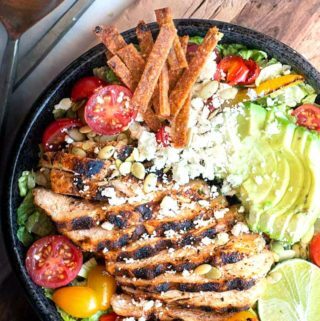 I know this swap isn’t as similar as the last two — but once you try the pepitas in this keto chicken taco salad, you’ll never crave corn again! It adds a delicious crunch and tons of flavor to your low carb taco salad. Maybe another stretch, but tomatoes make for the perfect and colorful low carb tacos topping. Use a mix of heirloom cherry tomatoes for a beautiful color pop. If you’re on a strict low carb diet, use tomatoes sparingly. I’m a total wimp with spicy food. If you aren’t, add some heat to your keto taco seasoning with cayenne pepper, chili powder or smoked paprika! I store a container of homemade taco seasoning in an old spice jar for future low carb taco salad making. If chicken isn’t your thing, try using ground beef or turkey for your keto tacos. Check out the instructions in my keto taco salad recipe for how to cook ground meat — after browning the meat, you’ll want to add water and taco seasoning to the pan and allow them to simmer together — this adds a ton of juicy, moist flavor to your meat. If you’re sticking to low carb recipes, cheese is about to become your new best friend. Melt the cheese into whatever shape you’d like for your very own low carb taco salad shell — make large mounds of cheese on a baking sheet for low carb taco shells, or cut the cheese into triangles for more traditional looking low carb tortilla chips. 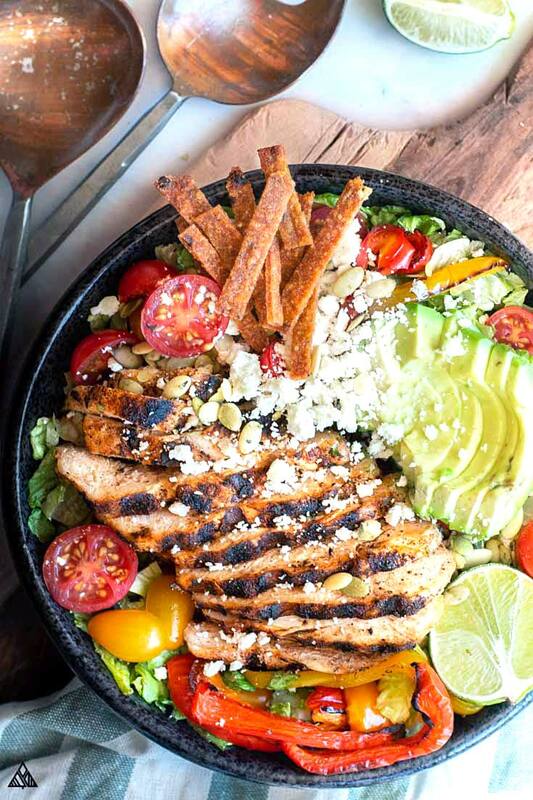 Now it’s your turn to make the low carb taco salad of your dreams! Let me know what you think in the comments below! 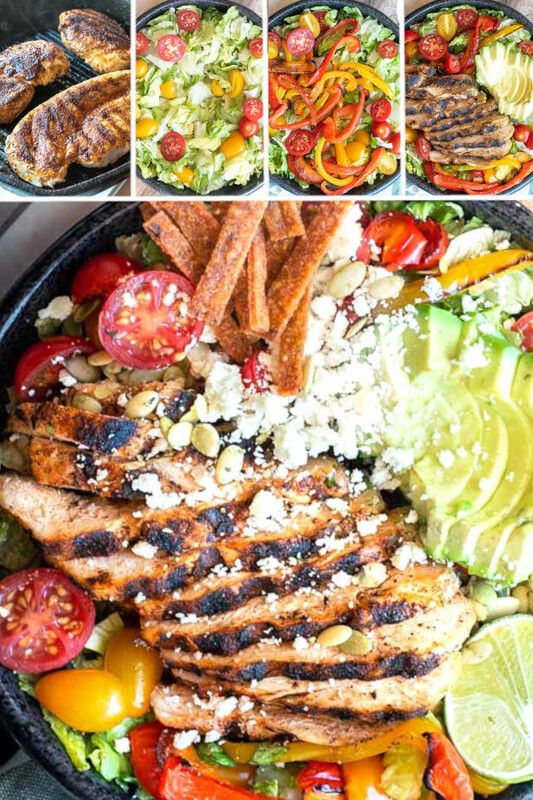 What did you top your low carb taco salad with? Enjoy! 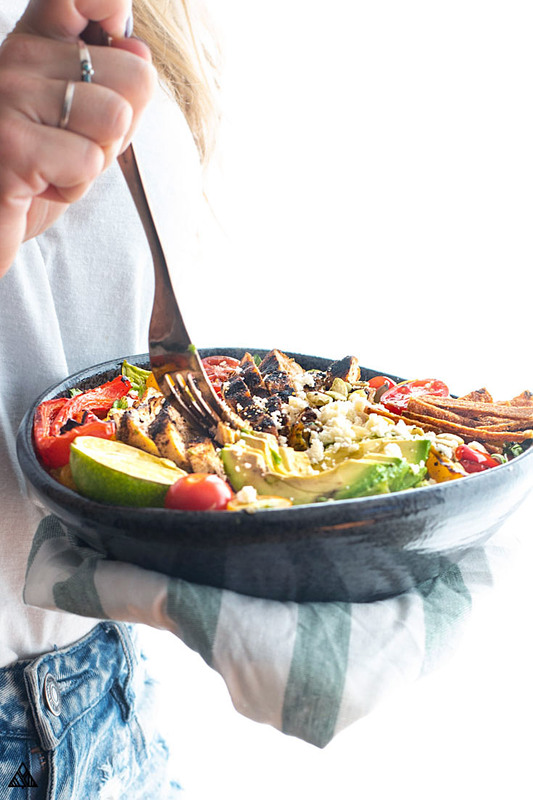 This low carb taco salad is the perfect throw together meal full of healthy veggies, delicious toppings and keto dressing! Preheat oven to 400 F and line a baking sheet with parchment paper. Spread a thin and even layer of pepper jack over the parchment paper. Bake for 16-18 minutes, or until the cheese begins to look crispy. Take baking sheet out of the oven, set aside and allow it to cool. Once it has cooled enough to handle and has completely stopped bubbling (if you do this too soon, the cheese will stick to the paper towels), place paper towels over the top to sop up some of the grease. Replace the parchment paper on top with paper towels to absorb some excess grease on this side. Using a pizza cutter, cut the cheese into long and thin strips — similar to tortilla strips. 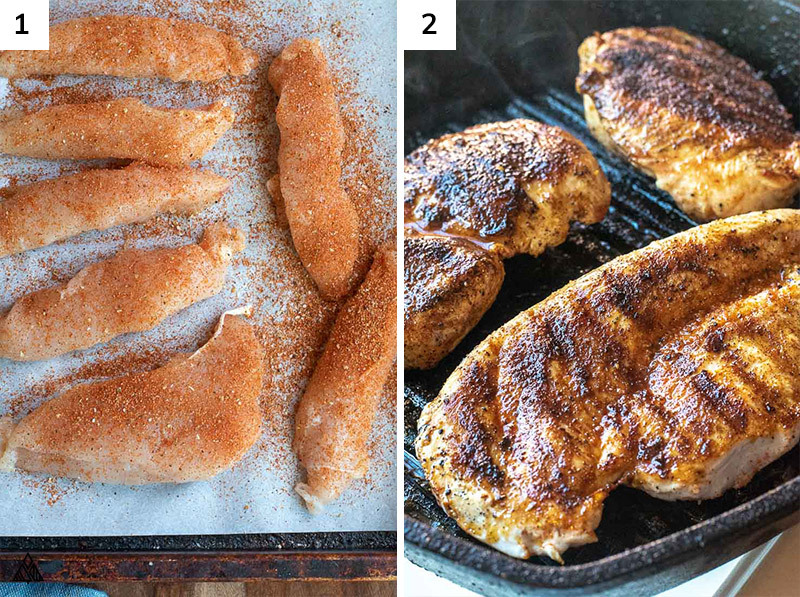 Meanwhile, season chicken on both sides with low carb taco seasoning and pat the seasoning into each breast. Heat 1 Tablespoon of vegetable oil in a large skillet over medium heat (I used a grill pan cast iron to get the grill marks). Add julienned bell peppers to the pan and saute until crisp-tender, about 8 minutes. Add chicken breast to pan and sear each side for about 3 minutes. Cover the skillet and continue cooking the chicken for about 10 minutes (until no longer pink in the center). Set the chicken aside with the peppers to cool slightly. In a large bowl, assemble lettuce and sliced cherry tomatoes. Add bell peppers and chicken. 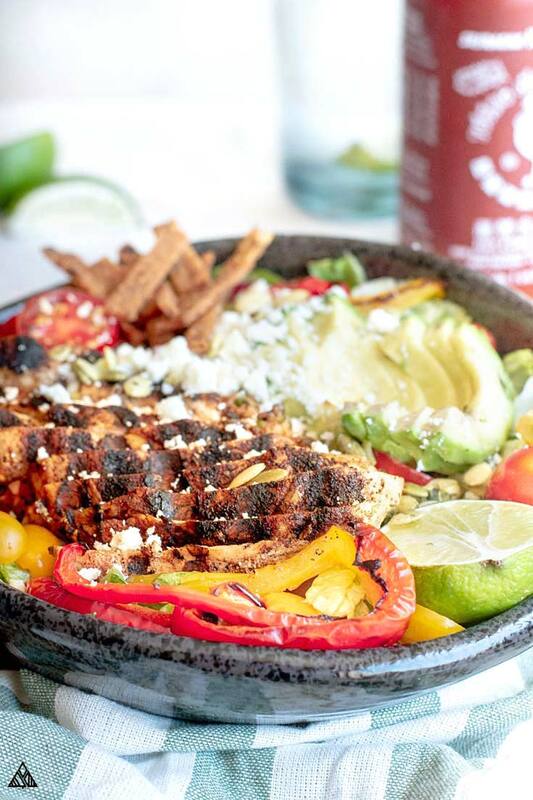 Cover with sliced avocados, cotija, pumpkin seeds and cheese strips. Serve with your favorite low carb dressing and enjoy! Pst — Did you know there’s a low carb taco salad at taco bell? In fact, there are a handful of low carb taco bell options for when you’re in a crunch — check out our guide!